Since The Empire Strikes Back, Jedi Master Yoda has been one of the most identified characters of Star Wars. From his playful introduction as a classical fool to Luke Skywalker to Skywalker’s sage mentor in the ways of the Force, Yoda’s instructions have permeated the very fabric of what the franchise means to many fans. “Do or do not, there is no try,” or “Size matters not,” are just a couple lines which almost anyone can attribute to the diminutive Jedi Master, and it’s in Yoda’s place as a teacher on the jungle planet that the character became iconic. Yet, at the same time, when it comes to merchandising, particularly to children, Yoda is most often depicted in the form he took during the prequel trilogy and The Clone Wars time period. As the teacher who firmly instructed Luke, “A Jedi uses the Force for knowledge and defense, never for attack,” a strident chord is struck between the character Yoda of the 20th Century and the Yoda of the 21st. In the original trilogy, Yoda appears twice, first in the sequel to the 1977 film and then briefly in Return of the Jedi. In the final film, the Jedi Master’s onscreen time amounts to providing Luke with final instructions concerning his confrontation with Darth Vader, advising the young Jedi that his hope of saving his father, Anakin Skywalker, was impossible. Then with the somber acknowledgment that upon his passing, that Luke would be the last Jedi, Yoda closes his eyes and disappears. This disappearance peacefully mirrors Obi-Wan Kenobi’s vanishing in A New Hope, as both Jedi became one with the Force. The end result, never explained, is the ability of the Jedi to appear after death as Force Ghosts, as seen in the Jedi best hits of the prequel era line up seen by Luke at the end of Jedi. This ability to become one with the Force isn’t abandoned, however, and came to serve as a bridge between the Yoda of the original trilogy and the Yoda of the prequel trilogy. Yoda returned to the big screen in 1999 in The Phantom Menace. The Yoda of the first prequel film was not too far afield from the Yoda of memory, a sage Jedi Master who offered wisdom from a seat on the Jedi Council. Our perspective of that Yoda changed dramatically, however, with Attack of the Clones. While initially Yoda’s role mirrored that of the previous film, his character emerged in the final act of the film as a general of a clone army and more specifically, a lightsaber wielding Jedi who confronted Count Dooku. Yoda lost the duel with Dooku, forced to choose victory over the Sith, and former apprentice, to save the lives of Anakin Skywalker and Obi-Wan Kenobi, but in a way, the Yoda who had never revealed ownership of a lightsaber and taught Luke Skywalker of a non-aggressive use of the Force had become a casualty. 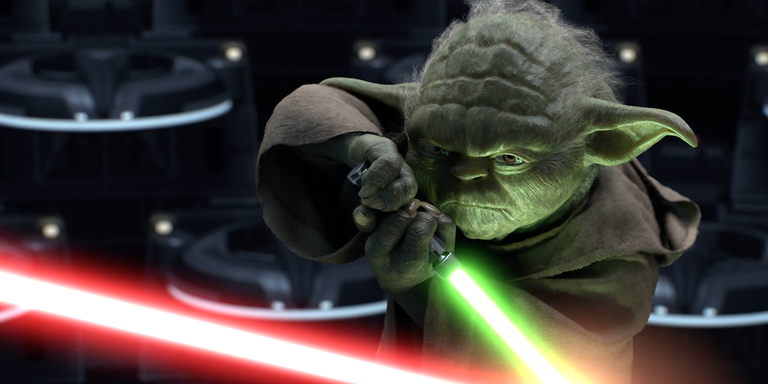 In the original trilogy, Yoda revealed one does not need a lightsaber to identify as a Jedi, and even advised Luke during training that he would not need to rely upon a weapon for one test. Luke ignored Yoda’s advice then, but in a transcendent moment in Return of the Jedi, Skywalker does cast aside his lightsaber when confronting the Emperor. This, done in parallel with Luke declaring that he is a Jedi (like his father before him), implied that perhaps a lightsaber alone did not make a Jedi. Thus, the complications that arose when the Jedi who taught Luke that lesson is depicted relying heavily on his lightsaber to deal with problems. Revenge of the Sith did not result in much of a change from the Yoda of the previous film. While he continued to be presented as a wise Jedi, especially as one not entirely happy with the course of events, Yoda was once again cast as a virtuous with the lightsaber in a duel against Emperor Palpatine (he lost that one, too). Prior to that moment, he had been on the Wookiee home planet of Kashyyyk serving in the capacity of general of the clone trooper forces. Only at the end of the film, the Jedi Master carrying the burden of having failed to not just save the Republic from destruction, but more importantly, preserved the Jedi Order, concludes he must escape into hiding. Yoda advises Kenobi, then, in the last in-person meeting between the two (that we’re aware of), that he should spend his time learning something from his former master Qui-Gon Jinn, i.e, learning the way to become one with the Force, and preserving one’s identity after death. While there is a scene where Yoda communicates with Qui-Gon that was filmed for Revenge of the Sith, it did not make the final cut. Instead, this seminal moment had to wait for exploration into Yoda’s character in the animated The Clone Wars. At the time of, and definitely following the prequel trilogy, the conception of the Jedi Order within the lore of the Star Wars universe was scrutinized through the lens of how did the Jedi fail to perceive and stop Sheev Palpatine, aka Darth Sidious, from taking over the Republic and destroying the Jedi Order. The extremely short version of the how is that the Jedi, in becoming embroiled in the war were blinded by the Dark Side, as the war not only distracted them, but lead many of its members astray from their own ethical code of conduct. Yoda was not immune from this problem, abiding Jedi Council decisions he did not agree with, and though recognizing the prevalence of the Dark Side in shrouding the Jedi, failed to realize until the end the magnitude of the problem. Incidentally, this occurs in what have been labeled The Lost Missions of The Clone Wars, thirteen episodes which were produced but never aired in the United States due to Disney’s acquisition of Lucasfilm. 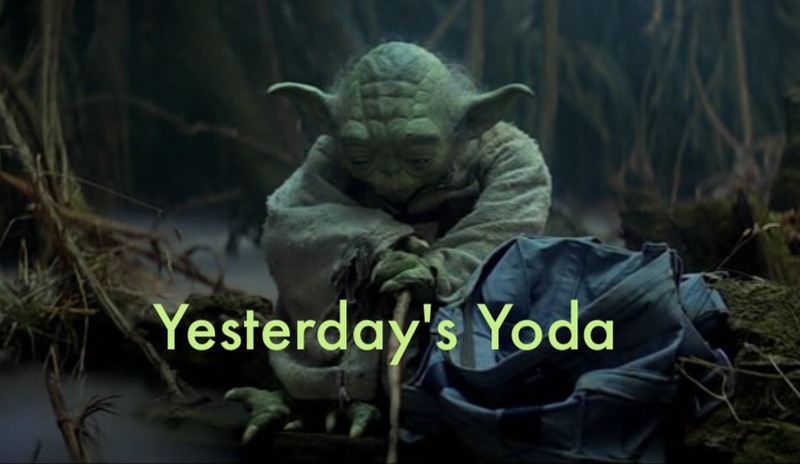 The episodes were later released, concluding with a two episode arc which focused on Yoda. In these two episodes, the missing conversation from Revenge of the Sith between Qui-Gon Jinn and Yoda is picked up, and Yoda is lead by Qui-Gon to a mysterious planet to learn the way of preserving one’s identity after death within the Force. Faced with the unknown, Yoda hands his lightsaber over to an accompanying R2-D2 before confidently going forward. It’s a signal moment, for while chronologically in-universe, he will take back the lightsaber to confront Palpatine in Revenge of the Sith, chronologically for the viewer, Yoda will never again wield a lightsaber. In effect, he has started his return to the Yoda of the original trilogy (or, as one might say, progressing toward that Yoda on the in-universe timeline). What follows are a series of tests by Force Priestesses, one of which includes Yoda facing a shadowy doppelganger, a Dark Side version of himself, created through his hubris of fighting in the war and believing that there was nothing wrong with this strategy. Only after Yoda admits that the Dark Side has found a place within him, can he control it and defeat it. It’s also a Yoda that recognizes that the Clone Wars are no longer the path to victory for the Republic or the Jedi. In the aftermath of the destruction of the Jedi Order and the fall of the Republic, we are presented with a Yoda who exists before Luke Skywalker arrives on Dagobah, but one who reflects that sage teacher. 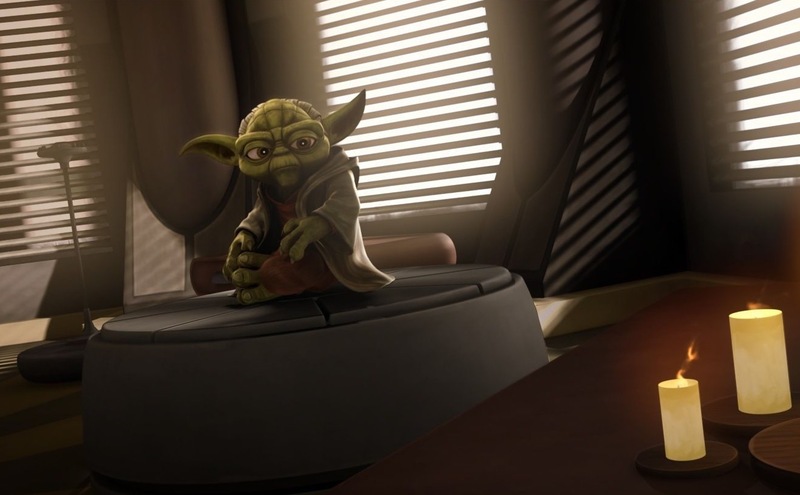 This occurs in Rebels, in which Yoda appears both through voice alone and as a vision to an aspiring Jedi padawan. In the aptly named episode, “Shroud of Darkness,” Yoda explains to Ezra Bridger why the Jedi fell, and points to their involvement in the Clone Wars. Furthermore, Yoda admonishes Bridger over his questions about power, regardless of what its uses. In effect stating that Jedi, even if they believed they used the Force for good in the Clone Wars, were still betraying the purpose of the Force, and hence, went down the path of the Dark Side. This is the Jedi who intoned that the Force was for knowledge and defense alone, never for attack. Unfortunately, this is not the Jedi we see most often in merchandising. That Jedi remains the Yoda who wields a lightsaber, not a cane and wisdom. Given the predominant selling nature that all Jedi must be pictured with their incredible laser swords, perhaps an allowance should be made among all the Lukes, Reys, Anakins, and Ahsokas, for a small, green philosopher of the Force. When Luke Skywalker traveled to Dagobah, he was not sent to learn how to fight with his lightsaber, but how to become a Jedi and discover the ways of the Force. In the process, Skywalker eventually came to realize that to be a Jedi, one’s weapon is not always needed, and in turn, it’s a very fine lesson for fans of all ages to accept and appreciate. And in our own bias view, the Yoda who engages in a tug of war with R2-D2 may very well be the best Yoda.